The success and achievements of the Azerbaijani gymnasts are the result of the great attention of the First Vice-President of Azerbaijan, President of the Azerbaijan Gymnastics Federation Mehriban Aliyeva to the development of this sport, the head coach of the Azerbaijani national rhythmic gymnastics team Mariana Vasileva told Trend on Oct. 25 after a ceremony honoring Azerbaijani winners and participants of the III Summer Youth Olympic Games, held in Buenos Aires. 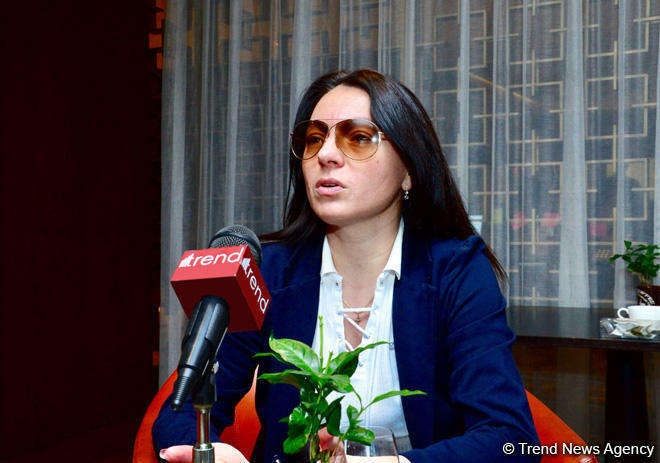 "Medals that Azerbaijani gymnasts win at the European and World Championships and other prestigious tournaments and competitions are the result of the contribution, care and attention of the President of the Azerbaijan Gymnastics Federation Mehriban Aliyeva," Vasileva said. The head coach said that she is proud of the fact that Azerbaijani gymnast Yelizaveta Luzan won the gold medal in the competition of mixed teams in all gymnastics disciplines at the III Youth Olympic Games. "Luzan is a young, very promising gymnast, although not yet sufficiently experienced. But I think she performed pretty well. Yelizaveta understands that the medal obliges her to work even harder and harder and it is also an incentive and motivation for our other girls," Vasileva added. Luzan will now be preparing for the next season, Vasileva noted. "We have to change exercises, since she switches the junior category to the adult. I hope that her first start will be in early March. She will have to fight for the main place in the Azerbaijani national team - six gymnasts will fight for four places," Vasileva said.